When I started my summer of HBO, The Wire was a priority viewing for me, as many critics whose opinions I respect have called it the best show on television. But when I watched the complete series of Six Feet Under, I worried that I might’ve peaked too early. Luckily, it turns out that I may have saved the best for last. You wouldn’t know it from watching any particular episode, especially the pilot. I watched the first couple episodes and thought “this is pretty interesting”, then a couple more and thought “this is getting pretty good”, then a couple more and thought “Wow. I can’t believe that television can produce a show like this”. It’s rare for me to think like that about a TV show, because I’m not of the mind that quality and television are mutually exclusive concepts. I actually believe that on a percentage basis, there’s more quality in popular television than there is in popular movies, and those who snobbishly look down on the entire medium have no clue what they’re talking about. So my shock with The Wire wasn’t so much that I was surprised that the medium could produce something of such high quality, but that the show is so different in its presentation and storytelling that it seems to mark a paradigm change. On its surface, The Wire is another police procedural, which is either the most overdone concept on television, or is at least in the top three (along with family sitcoms and medical dramas). For those who don’t know (which is probably a lot of people, since the show only seems to be popular with critics), The Wire details crime in Baltimore, following the process from both the police and criminal point of view. The title refers to the espionage equipment used to gather evidence against the criminals, which is the focus of the investigation as presented. This isn’t beat cops working the streets or lab rats analysing DNA, this is unglossed police work, monitoring phone calls, taking surveillance photos, and waiting for an opening. What makes the show so original is the depth it goes into the story, with each episode building on the next, slowly revealing pieces of the bigger puzzle until it all begins to make sense, all the while the entire case is threatening to collapse under its weight and the political pressure attached to it. In some ways, it isn’t a procedural at all, in that it isn’t a mere series of cases introduced and solved every week, using similar formulas to tell similar stories. Instead, the entire 13 episodes focus on one case, which begins on a lark, meant to be small, then grows into something larger than anyone had anticipated. Along the way, the series delves into all aspects of the case, from the junior detectives working surveillance all the way up to judges, the FBI, and congressmen, and from the drug kingpin all the way down to a kid drug runner working the corner. It’s a stunning feat of storytelling that I have never seen on this level. The level of detail, the sprawling cast, the intricate plotting, all of it operate on another level that simply blew me away. Just when you think you’ve seen all the medium is capable of, along comes a show like this to shake things up. In other ways, however, The Wire isn’t just a procedural, it’s an über-procedural. The show’s hyper-realism brings us into the nitty-gritty of police work, completely stripped of any of the flash we’ve grown accustomed to from cop shows. Which isn’t to say that it’s boring, the street drama brings plenty of action, and the stripped-down portrayal is fascinating. Once the case begins to build, it’s hard to focus on anything else as a viewer. I can’t say this enough: the depth of storytelling in this season is unlike anything you’ll ever see on television in terms of level of detail and stunning realism. The show sticks to this level of realism in its casting, going with character actors instead of big names, eschewing the standard television aesthetic of hiring beautiful people to fill blue collar roles. Instead, the characters look like real people and the actors win us over with their ability instead of their looks. Dominic West is the standout as Detective McNulty, the charismatic detective that starts the ball rolling on the entire investigation. 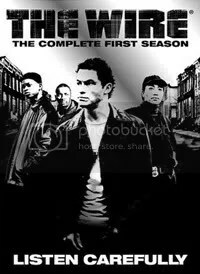 A bit of a loose cannon, McNulty is the closest thing the show has to a standard TV or movie cop, but whereas other shows would give him the hero treatment, The Wire is comfortable showing him with all his many flaws. On the police side, Sonja Sohn and Lance Reddick are also fantastic, and Wendall Pierce brings a lot of dry humour as Detective William “Bunk” Moreland. On the drug side, Idris Elba brings a level of intelligence to his role not usually seen in African American criminal roles, Larry Gilliard Jr creates a surprisingly sympathetic character as D’Angelo Barksdale, and J.D. Williams and Michael B. Jordan are standouts in supporting roles. And on a third side, Michael K. Williams‘s Omar Little is one of the best and most unique characters you’ll ever see on such a show. The entire cast is phenomenal, from the main cast to recurring characters (of which there are many). What’s surprising to me is how much I loved this show, given that before it, the number of cop shows I watched totalled zero (the same is true for procedurals). They usually don’t interest me, as I tend to prefer character-driven shows over plot-driven shows. But quality is quality, and when you’re dealing with a show of this calibre, the quality itself trumps all other concerns. I now must join the chorus of those in the know, and tell anyone who will listen that this isn’t just the best show on TV that people aren’t watching, it may very well be the best show on TV period. Believe the hype.